AllGems Limousine Transportation offers safe and reliable Orlando to Port Canaveral transportation service in one of our stretch limousine and luxury SUV / Sedan fleet vehicles. 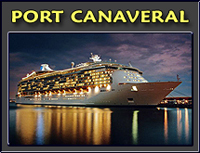 Port Canaveral is home to one of the most popular Cruise line and Cruise ship departure destinations in Florida. Home to Disney Cruise Line, Carnival Cruise Line, and Royal Caribbean Cruise Line, individuals, families and groups can enjoy 3 day, 5 day, and 7day excursions to various ports of call, as well as various fishing, diving, and other open water daily open ocean trips. Many families and individuals visiting the Orlando and Central Florida area seek reliable, safe, and dependable transportation for the purpose of visiting Cape Canaveral, and it's many attractions, sites, and events, making their stay entertaining and fulfilling. We offer professional, courteous, and dependable Orlando to Port Canaveral Transportation Service that is second to no-one. Our transportation vehicles are impeccably maintained, clean, and always in top operational readiness. Contact us today for your transportation needs at 407.438.3074 (locally), or outside the Orlando area at Toll Free 877.625.4367 for a free estimate and to reserve a limousine or luxury sedan. Contact AllGems Transportation Limousine Service today to request a quote for your Orlando / Central Florida Limousine and Transportation needs by calling Toll Free: 877.625.4367.